Well, last week happened. In one of the craziest college basketball weeks outside of March in recent memory, 14 ranked teams lost, including Nos. 1, 2, 4 (twice), 6 (twice), 8, 9, and 10. 33-17 -- ranked teams’ record last week, including a dismal 11-9 mark for top-10 teams. 11 -- spots up, the biggest jump this week. West Virginia 11 (No. 18 in Week 12 (Jan. 23), up to No. 7 in Week 13 (Jan. 30). In that time, the Mountaineers beat No. 2 Kansas (85-69) at home and Texas A&M (81-77) at home. 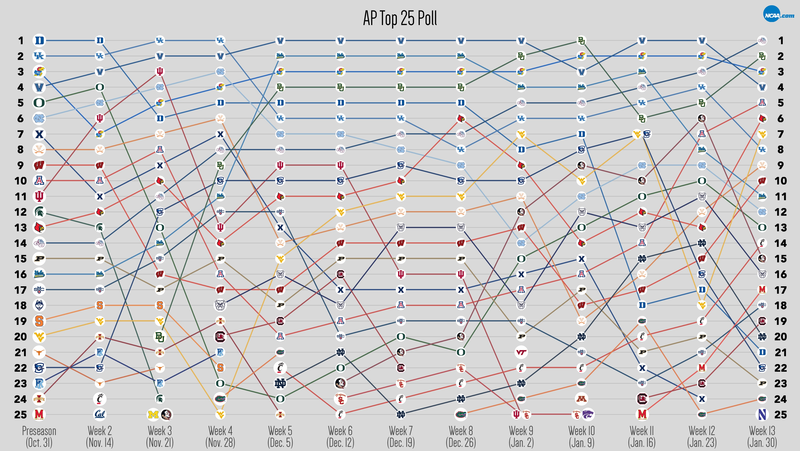 The upward swing comes a week after the Mountaineers fell from No. 7 to No. 18 after dropping games to unranked Oklahoma (89-97) and unranked Kansas State (79-75). 9 -- spots down, the biggest drop this week. Florida State suffered a 78-56 blowout at unranked Georgia Tech and followed it up with an 82-72 loss at unranked Syracuse. The Seminoles had been slowly climbing since they entered the rankings for the second time this year at No. 23 in Week 6 (Dec. 12), but this is the lowest ranked FSU has been since Week 8 (Dec. 26), when they sat at No. 20. 0 -- teams that didn’t move. In the most hectic week of the year, not a single team stayed at the ranking it held last week — the first time that's happened all year. 5 -- spots, the longest current upward streak. Arizona has been a red-hot 9-0 since Week 8's rankings (Dec. 26). In fact, the Wildcats' last loss came on Dec. 3 at now-No. 1 Gonzaga. During that span, Arizona has won its games by an average of 19.9 points per contest, with a statement victory coming against No. 3 UCLA (96-85, at UCLA). The win against the Bruins was the Wildcats only matchup with a ranked team since before Week 8. 2 -- spots, the longest current downward streak. This one is a tie between UCLA and Creighton. UCLA was 1-2 since the Week 11 rankings (Jan. 16), beating Arizona State (102-80), but falling to Arizona (96-85) and USC (84-76). The Bruins have fallen from No. 3 in Week 11 to No. 11 this week. Creighton was ranked No. 7 in Week 11 before beating No. 22 Xavier (72-67), then dropping games to unranked Marquette (102-94) and unranked Georgetown (71-51). The Bluejays now sit at No. 22, where they started in the preseason rankings. Xavier, which had fallen for two straight weeks going into last week, dropped out of the rankings for the first time all year this week. 1 -- teams that have never dropped in the rankings this year. That would be Gonzaga. The Bulldogs started off the season at No. 14 and have steadily climbed the ladder to their current No. 1 spot. Gonzaga is the only unbeaten team in the rankings, sitting at 22-0. 6 -- teams that were ranked in the preseason that have a net-positive ranking movement: Gonzaga (+13: started No. 14, now No. 1), Arizona (+5: started No. 10, now No. 5), Louisville (+8: started No. 13, now No. 6), UCLA (+5: started No. 16, now No. 11), West Virginia (+13: started No. 20, now No. 7), and Maryland (+8: started No. 25, now No. 17). 5 -- weeks, the most one team has stayed in the same position. It’s been done three times this season. Villanova stayed on top at No. 1 from Week 5 (Dec. 5) to Week 9 (Jan. 2) before falling to No. 3 for one week, then jumping back to the top spot. Kansas was No. 3 during that same span before climbing to the No. 2 ranking in Week 10 (Jan. 9). And Duke stayed at No. 5 from Week 4 (Nov. 28) to Week 8 (Dec. 26) before dropping to No. 8.